Pink Rain, The Governor, Pilbara, Western Australia, 2013. Edition of 3. The Road to Marble Bar, Pilbara, Western Australia, 2012. Edition of 3. Spectacular Arch, Great Sandy Desert, Pilbara, Western Australia, 2014. Edition of 3. Snappy Gum, Rudall River National Park, Little Sandy Desert, Pilbara, Western Australia, 2011. Edition of 3. Sunrise near Yandeyarra, Pilbara, Western Australia, 2014. Edition of 3. Dawn, Broadhurst Range, Rudall River National Park, Little Sandy Desert, Pilbara, Western Australia, 2011. Edition of 3. Summer Storm, Giles Point, Newman, Western Australia, 2013. Edition of 3. The Edge of Auriferous Country, Nullagine, Western Australia, 2005. Edition of 250. Closing Rainbow, The Governor, Pilbara, Western Australia, 2013. Edition of 3. Granite Outcrop, Nullagine, Pilbara, Western Australia, 2008. Edition of 250. Spinifex Circles, Little Sandy Desert, Western Australia, 2008. Edition of 3. The Gods Must Be Angry, Dust Storm Near Marble Bar, Western Australia, 2005. Edition of 250. Spinifex Fire, Newman, Western Australia, 2013. 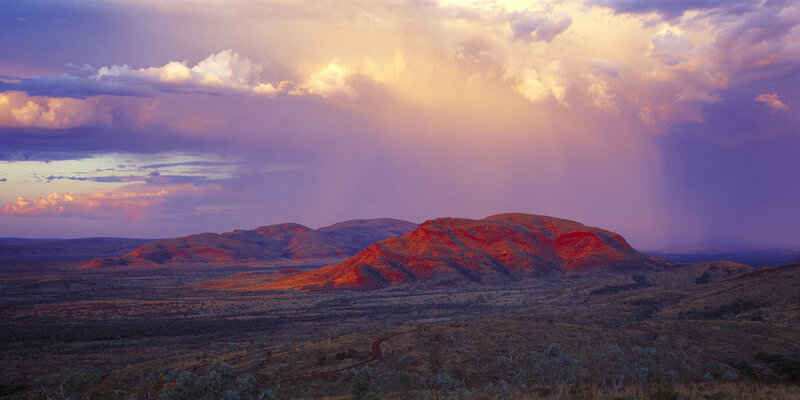 Summer Storms, Mt Edgar, Marble Bar, Western Australia, 2012. Edition of 3. Star Trails, Hanging Rock, Rudall River National Park, Little Sandy Desert, Western Australia, 2011. For me this process began on the side of The Governor north of Newman in early 2013. I’d decided that it was an important place that had never really been photographed well. With all the mining activity going on around it, and drilling activity happening around the sides of it, I wanted to make a strong photograph before it too eventually succumbed to the inevitable ravages of mining. A mountain of some two billion years in the making at least deserved the dignity of a photograph showcasing its beauty I believed. The process was not an easy one. Khokki bobs (squally storms) and little weather meant that virtually all of my time was spent dealing with the 40 degree plus daytime temperatures. Although the evenings were wonderful. Often spent sipping on a beer while watching lightning storms over the surrounding Hamersley Range. After nearly three weeks of waiting I got lucky and a spectacular storm came through late one afternoon. I made two images out of that storm that were very different to each other but both were very beautiful. I felt vindicated in my belief that persistence would pay. Little did I know that this approach would be sorely tested in the following summers making other images as part of this same project. More life lessons for the memory bank. The East Pilbara incorporates some of my favourite country anywhere in the world. It covers a massive area, extending from west of a line from Port Hedland to Newman and then right through to the Northern Territory border. But I love the tranquillity and the ability to spend time in places that few will ever get to see. It also where some of the major step changes in my photographic development have taken place. First, when I was learning to use a manual camera back in 1998. And then more recently when a major shift in my approach to photography took place. The learning to use a camera bit happened over a period of about an hour deep in the gorges of Karijini National Park. The change in my approach to photography happened over a period of weeks back in the summer of 2012/13. Most photographers – and I used to be one – chase the light. They keep moving until they find a spot when the light is going off. It’s an approach that doesn’t require so much skill. Because when the light is happening anyone can take a good photo. A beer can in the middle of a bitumen road can be made to look great.